1. 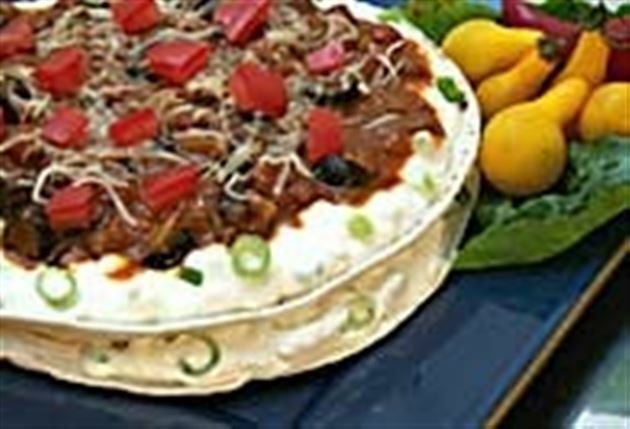 Mix cottage cheese, sour cream and green onions. In a separate bowl, mix bean chili, diced green chilies, olives and garlic powder. 2. On a greased cookie sheet, place 2 tortillas side-by-side. Spread each with a heaping tablespoon cottage cheese mixture. On top of cottage cheese mixture, spread 1 heaping tablespoon chili mixture. Place another tortilla on top of chili, and repeat procedure for another layer. 3. Bake stacks in a 350 degree F oven for 25 minutes. Remove from oven and sprinkle tops with cheese and tomato. Return to oven until cheese melts. Cut each tortilla stack into quarters. Enjoy this delicious Tortilla Mexican recipe!